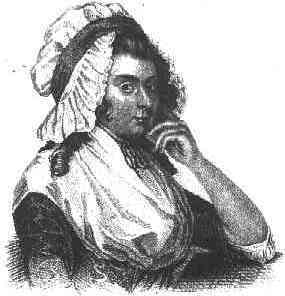 Ann Yearsley, known also as "Lactilla" or "the Poetical Milkwoman of Bristol", was one of a small number of successful eighteenth-century working-class writers. Her contribution to the anti-slavery debate was a celebrated poem, A Poem on the Inhumanity of the Slave-Trade, which appeared in 1788. Yearsley (née Cromartie) began her working life as a seller of milk. She was taught to read and write by family members, and developed a taste for Edward Young and John Milton. She married John Yearsley, a poor yeoman farmer in 1774, and spent the following ten years developing her writing skills while carrying out the onerous duties of a farmer's wife and mother of six children. The severe winter of 1783-1784 brought the family close to destitution, and led Yearsley to collect pig swill from the home of Hannah More. By August 1784, More had become aware of Yearsley's literary abilities, and she formed a plan to have Yearsley's poems published by subscription, using her aristocratic connections to further the project. Accordingly, Poems on Several Occasions appeared in 1785, and included poems on comic, tragic, and religious themes. The poems brought Yearsley fame and fortune, but they were also the cause of Yearsley's split with More. Yearsley accused More of defrauding her when More invested the profits, around £380, in a trust. The two fell out, but Yearsley eventually recovered the money and produced a new volume; Poems on Various Subjects (1787). Other poems followed, and over the 1790s Yearsley also produced plays and a novel. However, Yearsley was no longer financially reliant on her writing, as in 1793 she had opened a circulating library in Bristol which provided her main income from then until the death of John Yearsley in 1803. In that year she retired to Melksham in Wiltshire, where she died in 1806. More about Ann Yearsley Part of the University of Texas 'Women of the Romantic Period' project. Contains biography and several of her poems. Ann Yearsley Part of the 'Penn State Archive of Women Writing Before 1800'. A short biography and several more of her poems. A Poem on the Inhumanity of the Slave-Trade The full text of the poem.